Buy a 12 pack Lotus Organic Sampler and get a free ashtray! 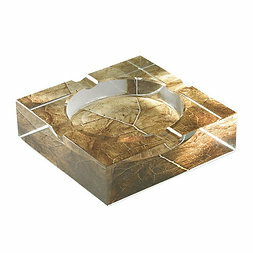 Tobacco Leaf Crystal Ashtray: The unique ashtray is made from clear K9 crystal with tobacco leaf art applied to the base that reflects throughout this entire piece in 3D. Four cigar rests and ample room for ashes. The LOTUS Organic cigar is one of our top selling cigars. They are 100% organic made without any of those nasty dies or flavoring. The LOTUS Organic taste the way tobacco should without any additives. The tobacco is grown in a small private farm in the regions of the Dominican Republic. After harvesting, the leaves are carefully cured, and then aged four years to produce a rich-tasting, well-balanced blend. These full bodied cigars have a pure, natural tobacco flavor augmented by woody notes.